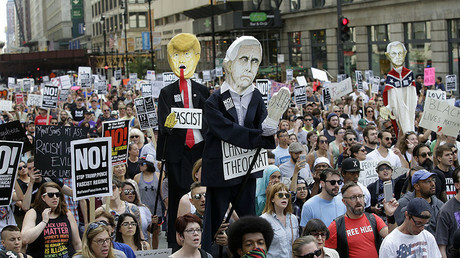 Monuments to Confederate generals and to those who fought for the South during the American Civil War have been targeted by protesters in a number of US cities, following the violence at a white supremacist rally in Charlottesville, Virginia. A protester in Richmond, Virginia climbed on a statue of Confederate General J.E.B Stuart and placed a black flag on the monument, cheered on by other demonstrators. “Tear the racist statues down,” the crowd yelled as the masked man ascended the memorial. Calling for the removal of monuments, the demonstrators marched to the historic Monument Avenue in Richmond, which served as the Confederacy's capital during the American Civil war of 1861-1865. 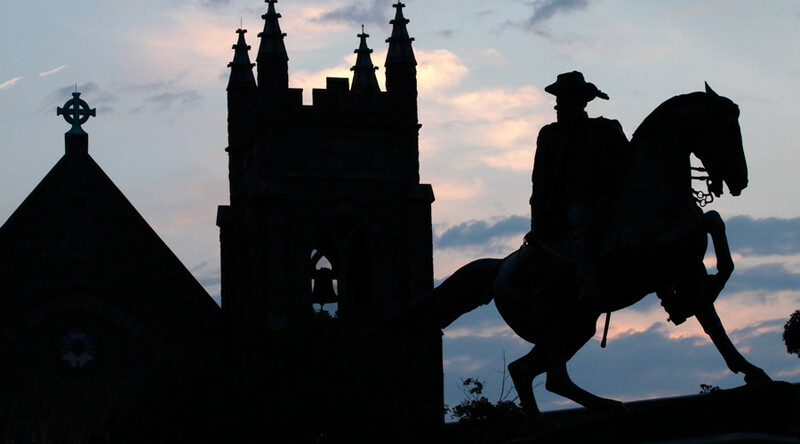 Many see the monuments as a reminder of the South’s support for slavery during the war. The Richmond protesters first wanted to head for the memorial of General Robert E. Lee but settled for the Stuart statue when authorities said only 20 people could gather at the Lee monument, according to Richmond Police Chief Alfred Durham. “Film the Klan, don’t film us,” demonstrators shouted at a CBS crew, according to the network. A photojournalist for WTVR, a CBS affiliate, was attacked by one of the protesters while filming the march on his cell phone, the channel said. The journalist was taken to the hospital and received four stitches to his skull. In Tampa, Florida paint had been tossed on and around Confederate memorial park columns with derogatory comments scrawled in the paint, Hillsborough County sheriff’s officials said. Other confederate memorials in the area had been targeted as well, AP reported. On Sunday, in Gainesville Florida, city authorities began to remove a Confederate statue that was created as a memorial to men from the area who lost their lives in the Civil War. The statue is being returned to the local chapter of the United Daughters of the Confederacy which erected it in 1904, AP reported. 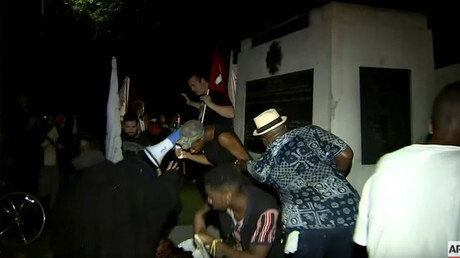 A confederate monument in Atlanta, Georgia was damaged and splattered with red paint by a group of activists who demanded its removal. On Saturday, the mayor of Lexington, Kentucky said that Confederate-era symbols – statues of Generals Breckinridge and Hunt Morgan – will be taken down from the city’s historic courthouse precinct. “I am taking action to relocate the Confederate statues. We have thoroughly examined this issue, and heard from many of our citizens,” Gray tweeted. He added that the situation in Charlottesville pushed him to announce the decision a week earlier than initially intended. A planned relocation of a monument to Confederate General Robert E. Lee from a park led to Saturday’s protests in Charlottesville where violence broke out as white supremacists clashed with those who came to protest against them. A man then drove his car into a group of counter-protesters, killing a woman and injuring 19 people. The violence in Charlottesville triggered the latest push to remove Confederate symbols from city squares across the US. The previous push came following the June 2015 shooting of nine African American churchgoers at the Emanuel African Methodist Episcopal Church in Charleston, South Carolina. South Carolina authorities responded by removing the Confederate flag monument from the state capitol grounds in July that year. The University of Texas in Austin took down its monument to Davis in August. In April this year, New Orleans began the planned removal of several Confederate monuments in the city, including the statues honoring Lee, Davis, and General P.G.T. Beauregard, who was born in the city. However, in neighboring Alabama, state legislators passed a bill in May that would prevent local authorities from relocating, altering or renaming “architecturally significant” buildings, memorials, memorial streets or monuments. The war that pitted 11 Southern states against the rest of the Union began in April 1861 and ended in May 1865. It claimed the lives of around 620,000 men – 258,000 of them from the South – which remains by far the greatest death toll of any war in US history.